Most of our rentals offer bikes, hot tubs, games and toys for the kids! Check out fun activities to do with the family here! "Great location for walking around Bend. Close to parks, restaurants,and a grocery store. Also only about 25 minutes to Mt. Bachelor alpine and nordic skiing. Perfect accommodation for a family (of 4, maybe 5). The second bedroom has two twin beds. In the basement (in addition to a washer and dryer) there is just about everything you could need for an infant or toddler. Lots of great books are available (kids and adults) and a wooden train set for kids too. The kitchen was perfectly equipped to cook. Gas stove and oven, lots of pots and pans, plenty of dishes and spices. Even lots of glass storage containers. It was perfect." This a wonderful house that has an amazing high end kitchen, and is nicely stocked with everything you would need. It easily accommodated my family of 5 and two "mature" parents. The open use of space on the main living area worked well for pre-dinner cocktails and a fun dining experience. 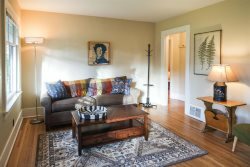 The house is in an awesome location, close to the historic downtown, and the decor is trendy and comfortable. We had an great time and the house was perfect!! !